Hello everyone, and welcome to the The Graveyard Shift, which is hosted by Kotaku's reader-run blog, TAY. This is a place to talk about life, video games, or anything else you want, so feel free to hop in and join in the topic discussion, or you know... talk about food :3 Then, when you're done, feel free to dive into other articles on TAY and TAYCLASSIC. Is this your first time on TAY? Then check out this handy TAYtorial! Is it my turn to host this thing again? UGH! Alright I guess it's time to talk about football... Yay!!! Did you see that ludicrous display last night? What was Felipao thinking by sending Fred against the Germans?! Division-Ten Adventures in Blind Gaming hit its number two edition in "Hands Off the Mutants, Please"
The Trainime series by Sylverfyst is on it's third entry - Go take a look if you're looking for a new show to watch during this summer! 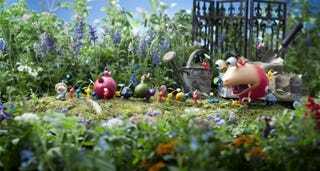 I've been having a blast playing the latest Pikmin game, collecting fruits and slaying "giant" insects has never looked better and felt so great. Plus, those fruit logs by the Koppaites are hilarious. This fruit's flesh is soft and pale yellow. It's juicy and has a sweet-sour flavor. I must also note that it's shaped almost exactly like a babies bottom. What the scientific merit of the observation is I have no idea. So... my question is... Are there any other moments in games where you wish you could do something about the events unfolding but for some reason you simply can't? Bonus Question: Is there a character in a game/tv show/anime/book that reminds you of a fellow TAYer?